Prior to the airing of the episode of the television show, Ellen, in which she comes out of the closet as gay, Ellen DeGeneres began dropping hints in the prior episodes leading up to it that she was planning to come out in real life and have her character come out as well. These hints included such sight gags as her TV character, Ellen Morgan, stumbling into an actual closet so that she could come out of it. She also invited comment with her off-screen actions, as when she kissed k.d. lang while presenting her with an award at a Los Angeles Gay and Lesbian Center function in early 1997. DeGeneres finally officially came out today, in Time magazine, with an April 14, 1997, cover emblazoned with the words, "Yep, I'm Gay." She appeared on The Oprah Winfrey Show with then-girlfriend Anne Heche the day "The Puppy Episode" was set to air, which is the name of the two-part episode in which her sitcom character realizes that she is a lesbian and comes out. Despite threats from advertisers and religious groups, "The Puppy Episode" was an enormous ratings success, won multiple awards and became a cultural phenomenon. 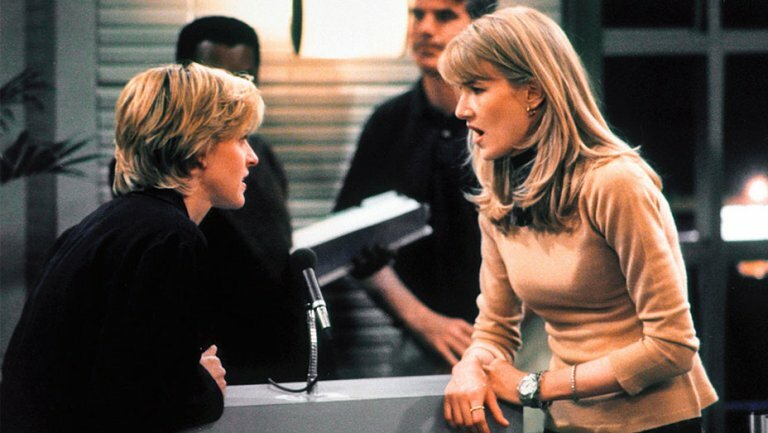 Nonetheless, DeGeneres and her show quickly garnered criticism for being "too gay;" the series was canceled after one more season and DeGeneres and guest star Laura Dern faced career backlash. With word of the episode out, backlash began. The studio received at least one bomb threat and Driscoll received a telephone call informing him he was going to Hell. DeGeneres was followed by car to the studio on at least one occasion by a "suspicious man." Some within the entertainment industry assumed that the coming out was simply a ratings stunt, to which DeGeneres responded, "I did it selfishly for myself and because I thought it was a great thing for the show, which desperately needed a point of view." "The Puppy Episode" and DeGeneres's attendant coming out generated enormous publicity before the show aired. Right-wing groups like the American Family Association pressured ABC to drop the storyline and Ellen sponsors not to advertise; two occasional advertisers, J. C. Penney and Chrysler, decided not to buy time during the episode. Another sponsor, Wendy's, decided not to advertise on Ellen again at all. Despite these losses of potential advertisers, ABC turned away ads from two LGBT-oriented sponsors, the Human Rights Campaign (HRC) and lesbian vacation company Olivia Cruises. Jerry Falwell called DeGeneres "Ellen Degenerate," to which DeGeneres responded, "I've been getting that since the fourth grade. I guess I'm happy I could give him work." Following "The Puppy Episode", Ellen was renewed for another season. ABC prefaced each episode of season five with a parental advisory warning. DeGeneres strongly criticized ABC for including the warnings, saying in an interview with Entertainment Weekly, "It was like this voice like you're entering some kind of radiation center. It was very offensive, and you don't think that's going to affect ratings?" With the cancellation of Ellen, DeGeneres focused her energy on stand-up comedy, where she had begun her career. She returned to network television in 2001 with the short-lived The Ellen Show, in which her character Ellen Richmond was openly lesbian from the start, before finding renewed success with her talk show The Ellen DeGeneres Show, beginning in 2003, which is still going strong. The impact of DeGeneres's coming out cannot be overstated. It was inspiring to untold numbers of LGBTQ people around the world. Her courage to come out on a such a public scale gave many other the courage to live their lives like they never thought they would be able to live -- as out and proud LGBTQ people. DeGeneres is considered a true hero to many people, not just for coming out, but for how she continues to be an example of how to be out. When Barack Obama awarded DeGeneres the Medal of Freedom in November 2016, he said, “It's easy to forget now, when we’ve come so far, where now marriage is equal under the law -- just how much courage was required for Ellen to come out on the most public of stages almost 20 years ago. Just how important it was not just to the LGBT community, but for all of us to see somebody so full of kindness and light, somebody we liked so much, somebody who could be our neighbor or our colleague or our sister challenge our own assumptions, remind us that we have more in common than we realize, push our country in the direction of justice." Ellen is one of my heroes, she came out and suffered for the rest of us. I think she set the industry on the path towards change. To this day it's one of her funniest jokes when she told the woman "I'm gay" and leaned too close to a microphone. I personally feel it was her giving voice to the character Dory in finding Nemo that started her career on it's recovery. People finally saw she was a talented funny lady who just also happened to be gay.